Dev and Jack are swimming in the pool when Jack has an idea - they can pretend they are swimming in the sea! 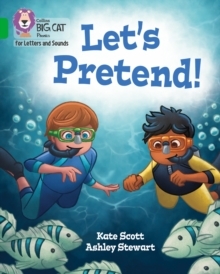 Find out all the creatures they see on their swimming adventure in this imaginative story by Kate Scott. Green/Band 5 offers early readers longer sentences with a varied and larger number of characters involved and events sustained over several pages. Non-fiction uses less familiar, more specialized vocabulary. Ideas for reading in the back of the book provide practical support and stimulating activities.